There is a reason grower use a paper wrap while packing eggplant. The skin on eggplant is very sensitive, easily bruised, nicked and scuffed. 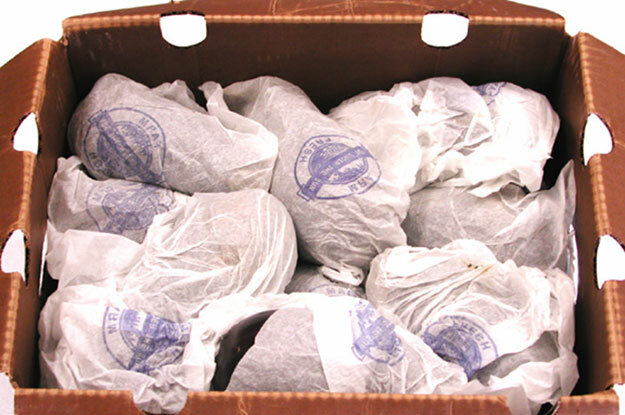 The paper acts to protect the surface of the eggplant from damage. When you inspect eggplant you should be careful when removing the paper and be sure to re-wrap the eggplant when you finish. You may find scars, which were present when the eggplant were packed, that occurred during the growing season. But what you should look for are condition defects, that progress and become worse. Some common defects you are likely to find are sunken pitted areas, brown to dark brown surface discoloration, shriveling and bruising. Bruising may be found, but be careful the bruising is actually bruising and not just flattened areas on the eggplant as a result of on eggplant being packed up against another eggplant. A bruised area will be soft to the touch and in some extreme cases actually show discoloration affecting the flesh. Taking a look at the image above, you can see three condition defects. 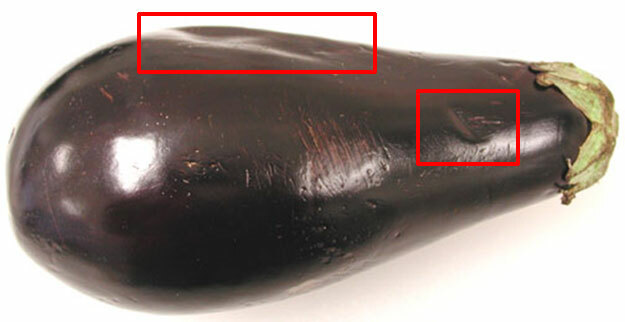 The highlighted areas depict bruising, but you can also see some slight discoloration, from the eggplant being rubbed or scuffed during the packing or shipping process, and if you look closely you may see some sunken pitted areas. The USDA Inspection Instructions state, bruising will be scored as a defect if the bruising exceeds an area of 1 inch in diameter. To give you an easy guide, a quarter is approximately 1 inch in diameter. You are not required to cut the eggplant to determine if bruising is a defect, but the area must exceed 1 inch in diameter. We will cover the other common defects in future posts. Will you write a post about this? Barb, thanks for your cooments. Are you looking for information on any particular defect? Im having trouble distinguishing ‘discoloration’ from bruise/sunken. Does discoloration mean just the surface is discolored-brown patch? A photo or description would be super! Thanks!